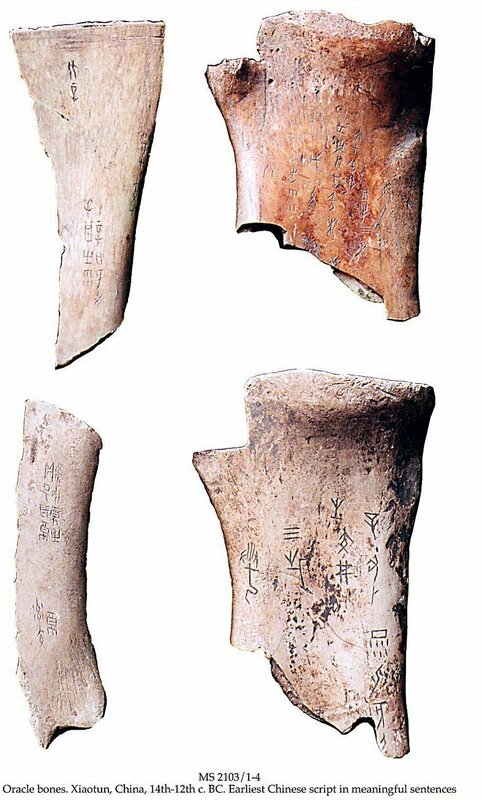 Description	 MS in Chinese on oxen scapula bone, Xiaotun, China, 14th-12th c. BC, 1 bone, 11x7 cm, (6x6 cm), 4+2 lines in Chinese book script, prepared and cracked with burned marks on reverse. Provenance	 Around 100,000 oracle bones are known, widely scattered in museums and collections around the world. 7 of these are in The Schøyen Collection. 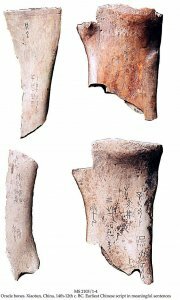 Nearly all known Chinese oracle bones derive from Xiaotun near the ancient capital of the Late Shang Dynasty of Anyang. The oracular use of the bones involved the interpretation of pattern of cracks which appeared on the bones after subjection to heat by the application of a heated metal rod. The text records the interpretation of the oracle and the date of its production. The oracle bones are so far the first preserved evidence of Chinese script in complete meaningful sentences.